It’s Saturday night! I had to investigate K.K. Slider’s Saturday live show. 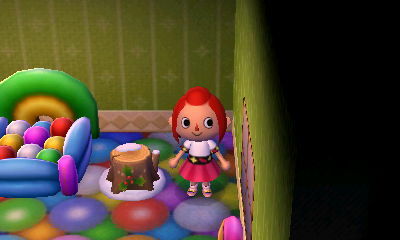 I did a bit of investigating, and the stool I got from Pelly is indeed a tree stump stool. It’s available from 12/1-12/31 according to the official site. While my picture isn’t appropriately themed (balloons and snowy tree stump don’t mix), here it is in all of its holiday glory. 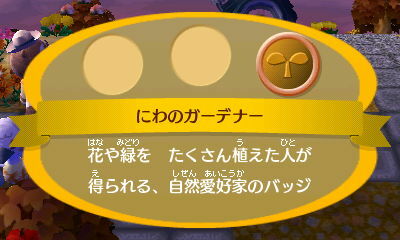 This is a badge for nature lovers, people who planted lots of flowers and increased greenery. Club 444 wasn’t technically open this evening before K.K.’s show. The lights were off. Nevertheless I was able to get inside around 6:30. (I’m not sure what the open hours are). 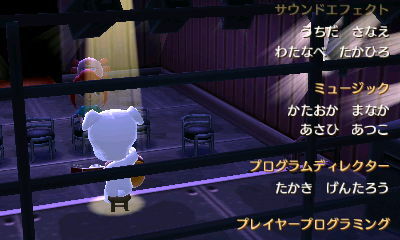 Shrunk was in the club cleaning and setting up before K.K.’s act. 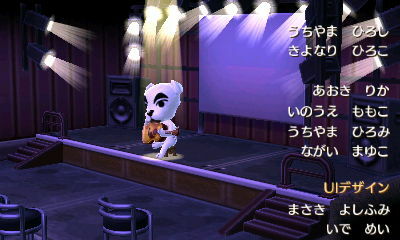 He began to reminisce about the good old days and his act on the stage. If I was interested in his jokes he would show me his act once in a while—not for money. Something to eat would be plenty of payment. 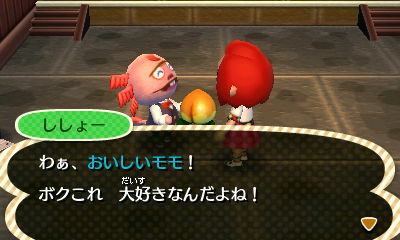 I brought him a delicious peach. And true to his word he showed me his act. Only a mother could love that face. Afterward he gave me a joke book. This book stores my “reactions” or emotions or whatever you want to call them. It added a new button on the bottom screen. You can touch the button and then touch whatever reaction. It looks like it stores a lot of them. I only have one right now. I forget what it’s called officially. I shrug and look exasperated. (I like to think of it as my “what the f★ck ever reaction”.) I didn’t get a pic of it. I’m sure it’ll come up soon. During the set-up phase you can go up on stage. You can’t access it while K.K. performs. 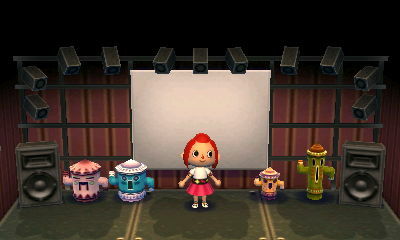 You can switch out the gyroids. If you see one you want, you can bring one of yours, “talk” to the one you want and switch them. 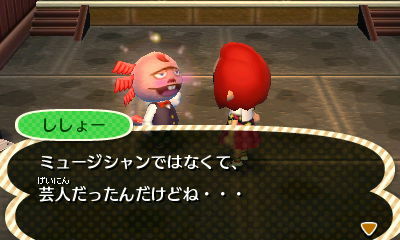 I hope Brewster still stores gyroids. I’ve never really cared for them. 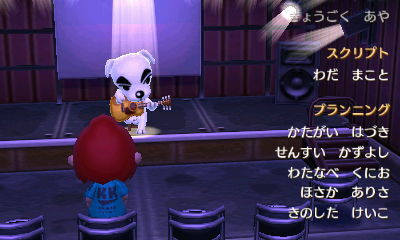 I came back at 8PM to listen to K.K.’s act. He didn’t let me choose a song (which is fine because I don’t know their names in Japanese), but just launched into a random number. 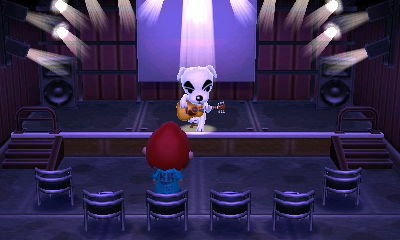 I took a seat after talking to him and he said he was going to play K.K. Milonga (after which Kokuto and I had a spirited debate about whether Milonga was a real dance/song.) Apparently it’s like the tango. 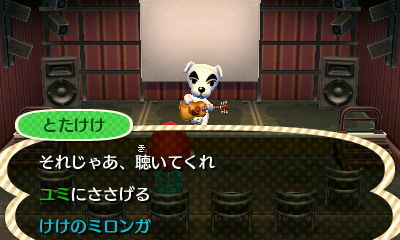 The credits rolled as K.K. strummed and wailed. I did actually watch this in 3D. It looked pretty sweet. 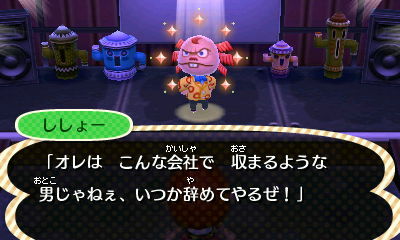 This entry was posted in Animal Crossing, Video Games and tagged Animal Crossing, とびだせ, どうぶつの森, Dr. Shrunk, K.K. Slider, new leaf by Jennifer. Bookmark the permalink. Hahahahaha!! What a killer ending. 😀 Poison Frog was a model? Amazing! LOL great post!! I’m very excited that Dr. Shrunk is still performing, and that you get more storage for your emotions. Hahah that sounds so weird. 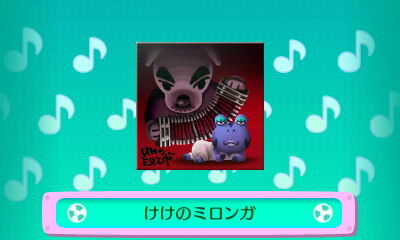 OMG that album art is hilarious. I hope every song has a random album cover that goes with it! That will be awesome.